With Fantastic Handyman, your new flat pack furniture will be assembled correctly and quickly by a polite and precise professional. We got the skills, tools, and know-how to turn those packaged parts into furniture that you'll use for years to come. 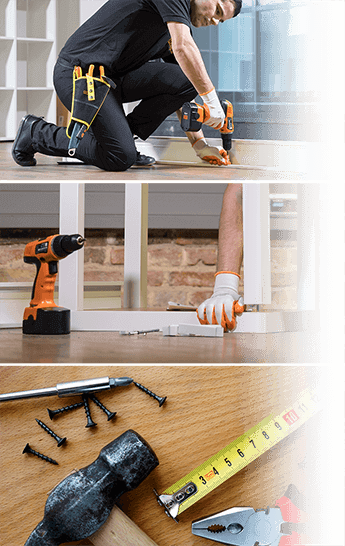 Each Fantastic Handyman is fully equipped with the tools required to join together any type of ready-to-assemble furniture. We can fit all kinds of furnishings, even if small parts and bits (like bolts and screws) are missing. Also, all handyworkers carry public liability insurance of 5 million pounds. And they make sure to tidy up after they’re done with the job. Easy to book, fast to get! You can book your Fantastic Handyman by using the simple online booking form. Also, you can make an appointment in 30 seconds via the GoFantastic app, which also grants you access to other services such as professional cleaning, gardening, pest control, and more. Our rates for furniture joining are hourly based. You are only charged for the time your job takes. There are no hidden fees. The minimum booking time is 1 hour, after it you are charged for every half or full hour. The handyworkers are experienced and dedicated to their job. They work with efficiency and concentration, without wasting time just to charge more as their schedule is quite busy. Also, we follow the performance of each handyman by collecting customer feedback so our standards remain high and customers happy. Shopping for flat pack furniture can be a hassle, we know. Not to mention if you don't have a suitable vehicle to take home all those new purchases. So just give us the unique shopping codes of the items you want for your place and we'll bring them to you.